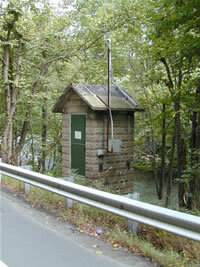 LOCATION.--Lat 4l`30'16", long 75`32'33", Lackawanna County, Hydrologic Unit 02050107, on right bank along SR 1012 in Archbald, and 0.5 mi upstream from White Oak Run and Gilmartin Street bridge. PERIOD OF RECORD.--October 1939 to current year. Prior to February 1940 monthly discharge only, published in WSP 1302. GAGE.--Water-stage recorder. Datum of gage is 889.33 ft above National Geodetic Vertical Datum of 1929. Satellite and landline telemetry at station. Supplied by NWS: Action stage-6.2 ft; Flood stage-8 ft; Moderate flood stage-9 ft; Major flood stage-10 ft.